Located in Atlanta, Georgia, this is a favorite local with many animals and plants on display for guests! Some of the zoo's favorites include the sloth, the Sumatran Tiger, very rare red panda, kangaroos, african elephants, giraffes, lions, gorillas, orangutans, zebra and wild pigs! Bears, leopards, monkeys, lemurs and rhinos round out the impressive list of mammals that are housed in this beautiful zoo! In addition, if you are a lover of reptiles and frogs, this zoo has many a variety including tortoise, snapping turtles, alligators, pythons, vipers, lizards, dragons, treefrogs and golden frogs! For aviary enthusiasts, the following exotic birds are home to Zoo Atlanta: pheasants, kookaburras, milky eagle owls, ostriches, wreathed hornbills, blue cranes, king vultures, chilean flamingos and more! This zoo also features one of a kind foliage including the infamous venus fly trap, sundew, amusing looking pitcher plants and more carniverous flora! 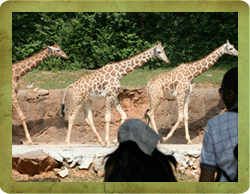 To view Zoo Atlanta Tickets, Specials and Coupons, go to their special page by clicking here. Zoo Atlanta updates this page throughout the year, so check back to see if new specials and coupons have come in. Note to our visitors: Zoo Atlanta Specials and Coupons can change without notice. So please visit their official website to make sure of the latest pricing and coupons.